FREE OFFERINGS inspired by the input received from local artists and visitors during SWAN Days Allegany County NY. 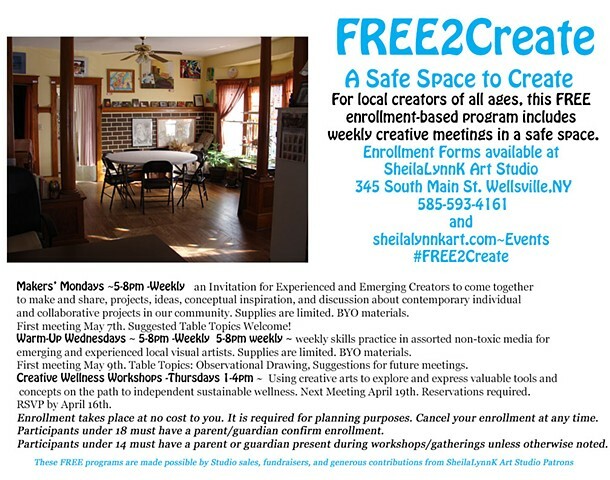 Many visitors mentioned the need for a creative gathering space to learn new skills, practice the ones they already know, and create and share ideas. So, here it is. MAKERS' MONDAYS ~ 5-8pm weekly ~ an Invitation for Experienced and Emerging Creators to come together to make and share, projects, ideas, conceptual inspiration, and discussion about contemporary, individual and collaborative projects in our community. Supplies are limited. BYO materials. First meeting May 7th. Suggested Table Topics Welcome! WARM-UP WEDNESDAYS ~ 5-8pm weekly ~ weekly skills practice in assorted non-toxic media for emerging and experienced local visual artists. Supplies are limited. BYO materials. First meeting May 9th. Table Topics: Observational Drawing, Suggestions for future meetings.